1 Tuner + 1 or more non-Tuner Gusto monsters. When this card is Synchro Summoned: You can target 1 Gusto card in your Graveyard; add that target to your hand. Your opponent takes any Battle Damage you..
2 Level 4 monsters. After damage calculation, if this card destroys an opponent's monster by battle: You can detach 1 Xyz Material from this card; shuffle the destroyed monster into the Deck instead o..
You can Ritual Summon this card with any Gishki Ritual Spell Card. Once per turn: You can declare a card type (Spell, Trap, or Monster); your opponent can discard 1 card to negate this card's effect, .. This card can be used to Ritual Summon any Gishki Ritual Monster. You must also Tribute face-up monsters from either side of the field, whose total Levels equal the Level of the Ritual Monster you Rit..
A Gem-Knight officer of high-rank, who has optimized the use of the crystal powers. Despite his ability to overwhelm most opponents, he's wary of stretching himself too thin, and opts for solidarity w..
1 Gem-Knight monster + 1 Thunder-Type monster. Must first be Fusion Summoned. Once per turn: You can send 1 Gem-Knight card from your hand to the Graveyard to target 1 face-up card on the field; destr.. Cannot be Special Summoned. During the End Phase of the turn this card is Normal Summoned or flipped face-up: Return it to the hand. When this card is Normal Summoned or flipped face-up: Negate all Tr.. When this card is Normal Summoned: You can reveal the top 5 cards of your Deck, send any revealed Ritual Spell Card(s) or Gishki Monster Card(s) to the Graveyard, then return the other cards to the bo.. 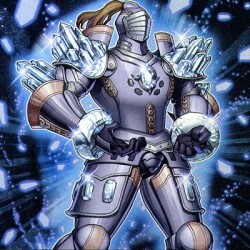 When this card is Normal or Flip Summoned: You can target 1 other monster you control; return that target to the hand. You must control another face-up Gishki monster to activate and to resolve this e.. When this card is Normal Summoned, if you have a Laval monster in your Graveyard other than Laval Blaster: You can choose a number from 1 to 5, then send that many cards from the top of your Deck to t..